A New Mac Tip Every Day: Navigating through dialog boxes! You can easily change around which one the blue outline is with "Tab". "Enter" will continue to be to choose the default highlighted choice. "Space Bar" will let you choose the one with the blue outline around it. wow, nice! i would have never known.. Awesome! I was just wondering how to do this! This is one of those "simple things" that I have NEVER been able to figure out! One solution I found that works in Firefox (you might want to try it elsewhere) is when a dialogue pops up, pressing Control and the first letter of the option you want to select. So to remember a password for a website when prompted, I'd press Control-R. Must be a hang over from being a Windows convert! I don't have that option switched on and I've always been able to use tab and the arrow keys to navigate. Another good key combo to use is the Apple key with the arrows. Apple-down arrow opens any file. Apple-up will move you upwards in the directory structure. As well as apple [ or apple ] will move you back and forth in finder windows/safari pages. (So if you go from home to Network, then when you hit Cmd-[ you will go back to Network. While if you hit Cmd-UpArrow you will go to the Users folder. I have done this ("Full keyboard access": "all controls"), but tab still doesn't work for me. Neither do arrow, cmd-arrow, cntl-first letter. Nothing. Return does execute the default though. Any thoughts?? brilliant! i've been looking for this forever! thanks! Oh wow, this will definitely save time. Thanks! this great!! I was wondering about this yesterday!!!! This is the ONLY thing I missed about my old PC laptop. And now it's on my Mac. WOW! This is great, i've always wished for a way to do this. Thanks! It seems it doesn't work in all the dialogue boxes for me for some reason... don't know why. 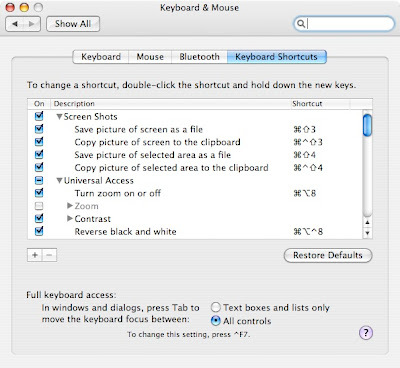 You may press Option key for 3 sec and you will see each shortcut on every button of the dialog box. A good way too, to be ba faster. I got it to work, for those who care. The problem was that this tip wasn't complete. You *also* need System Preferences -> Universal Access -> check Enable access for assistive devices checkbox. That was intuitive, wasn't it? Fantastic! This has bugged me since I got my mac - thank you! This is a good tip. However, I still miss my "hot-keys" (like ALT+"a letter") in Mac world! For instance, to reset Safari, I need to use mouse, click on Safari on the Menu, then scroll down to select "Reset Safari". It would have been much more productive to ALT+S (for selecting Safari) and then another "hot-key" to select "Reset Safari". Of course, if I have set "Full keyboard" in System Preferences, I can use Control+F2 to select the menu. But this also means, 1 Right Arrow Key and 6 Down Arrow Keys! 9 Key strokes instead of two keystrokes! Is there anyway I can get this "Hot Keys" behaviour in Mac OS? Thank u! Very helpful tip! I was so happy to find this but it doesn't seem to work, at least in some apps. I have Word and if I change a document and then try to close it without saving, a dialog box prompts me to "do not save changes", "cancel", or "save"". The "save" choice is darker/flickering. I can now tab thru the choices, with a highlighted outline moving along, but the "save" stays darker, and no matter what I highlight, when I hit enter, it saves the changes. Is it a fluke of Word, or did I miss something? Thanks!